Not rarely a well prepared claim on either copyright or trade mark rights violation (for domain disputes) is simply broken due to absence of infringement proofs that should be provided to the court, namely content of web-site pages at the moment of infringement). Aspiration for the compensation receipt up till 5 million rubles leads to carelessness in proofs collection. “Internet and Law” legal company helps both natural and legal persons in notarization of content of sites and web pages in the Internet. Notarization (web site or page survey protocol) is arranged upon request of “Internet and Law” legal company in our witness’s presence. Pages' hardcopy is attached to the web site survey protocol. 1. The service is rendered with respect to the pages in Russian. According to the actual legislation information in other languages should be translated into the Russian language (in accordance with tariffs of a translation bureau). 2. 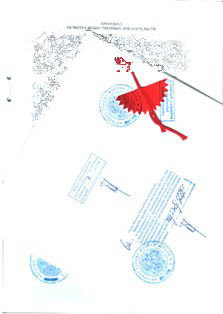 It is advisable to arrange a notarized copy of the protocol. The price of a copy and of its notarization: 300 € + 25 € per page. 3. If there is a technical opportunity notary assurance of audio/video recording can be fulfilled (without transcription). Total price of services increases by 200 € per every recording. Price: 400 € + 50 € per page. in 48 hours - standard tariff +50%. Please use our calculator to determine the price for notary assurance. For exact calculation of your order we need web page addresses (URL) from you (or exact description how to find them). Also indicate in what term you would like to receive the result and whether you need a copy. On the basis of this information we realize the exact calculation of the service cost especially for your order. If price/term suit you, we conclude a contract and render services. The results can be delivered by courier within Moscow Ring Highway (MKAD) or send by post to other cities/countries. We have successful experience of using of our protocols in Russia, Ukraine and the Republic of Belarus. Send us a list of web pages, that are subject to be notarized, information about necessity of copies of the protocol and the term of the service to mail@internet-law.ru. If you pay the services without cash by written order, you will not need to meet previously for conclusion of the contract.